Grifoll adds a new member to its (EC) 1223/2009 certified tattoos: the tattoo with fluorescent effect. From now on, besides glitter, glow in the dark, gold and silver – our clients will be able to launch promotional campaigns all over Europe with the fluo tattoo knowing that they are complying with the current European cosmetic regulation. Can any tattoo have a fluo effect? Three colours are currently validated: red, pink and yellow. 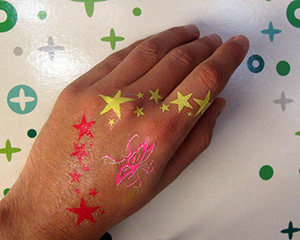 These three colours can be combined with other non luminescent colours to create any design, so the temporary tattoo will have visual impact both at night and daylight. Phosphorescent effecthappens when the tattoo glows in the dark by itself. The chemical composition of the ink absorbs the light during daytime in order to release it when it’s dark. On the other side, fluo tattoos shine when a UV light is applied. The ink doesn’t glow by itself, but the fluorescent effect works as long as a UV light is applied. As an example, this makes it an ideal temporary tattoo for parties because it glows all night long.